My inspiration for creating Be Digable is to help female executives elevate their presence online in order to be seen as the thought leaders they are within their companies. Here is our list of female executives making their mark on social media. In this month honoring Women’s History and International Women’s Day, we are thrilled to be highlighting Juliet Horton, Founder of Everly, a service revolutionizing the wedding industry. Juliet is a woman with incredible ambition and a crystal clear vision of where she is going with her business and the impact she is looking to make on her industry. Juliet and I both went to Loyola Marymount University and were actually in the same sorority (Pi Phi shout out). We recently reconnected through social media and our ventures into the entrepreneurial world. I have so enjoyed hearing the story of her career and what has led her to taking on the wedding industry with her company, Everly. Everly is ‘wedding planning reinvented’ with the goal of saving couples hundreds of hours and thousands of dollars on wedding planning. In our conversations, I was so impressed with Juliet’s confidence in taking on a huge industry that is so ready for disruption. She truly is a women who leads. Get to know more about Juliet below! Did you have any bosses or mentors that taught you or modeled what it was to be a great leader? The best leaders I have worked with have practiced what they preached and looked to set a strong example by their actions, not just their words. I always appreciate when someone leading a team or with a high ranking title is willing to roll up their sleeves and still do the work, not just see themselves as the task master. Sallie Krawcheck. I started my career in financial services and at the time Sallie Krawcheck was the CFO of Citi, where I worked. My manager told me he thought I’d be the next Sallie Krawcheck and I took it to heart. She has since left Wall St for the tech world (as have I) and she is running a company she founded focused on women gaining power in the investing world. I have followed her career for inspiration and motivation for paving the way for the next generation like she did. What is the best advice you received on how to run a business? Get out of the building. The startup world is filled with product obsessed founders who love to build. You may think you know what your customers need but you will not be able to validate that until you get out into the world and talk to people – customers, potential customers, investors, etc. This is especially true in the startup space but applies to any industry or profession – doctors talking to their patients, politicians talking to their constituents, academics talking to their students. Solicit feedback form as many people as you can and be willing to learn from it. Celebrate every win. When I started my business, I thought that the only thing that mattered was new customers and money in the bank. That matters a lot but it is not the only metric worth tracking and celebrating. Enjoy the wins along the way like press coverage, customer reviews and referrals. Milestones will keep you and your team motivated. Everly Tip: The best budget advice we can offer is to go all in on a few things you care about and let go of everything else. You'll enjoy your wedding (and the planning process more) if you can splurge on the things you care about most. Just start. You are never going to be entirely qualified or prepared and trying to get everything perfect before you jump into a leadership role or a new project will prevent you from ever starting. Know what you are good at, hire other people to manage tasks you are qualified for and learn what you need to learn along the way. I have no technical background but have great software developers on my team; if I had tried to learn to code before I started my business, I’d still be preparing. I always wanted to do big things and I don’t think I ever really thought about whether I was qualified to be a leader or not. This is a skill you learn and continue to learn throughout your career – it’s not like anyone has it or they don’t. If you want to start leading a few people, a team or a company, convince yourself you are capable of doing big things. If you believe it other people will too. My personal brand is important to me because it is my way of bringing a fresh perspective to the wedding industry. Much of the narrative in the wedding industry encourages couples to overspend, both in terms of time and money (and stress). My business and personal brand is all about giving a voice to couples who feel alienated by the current industry and think they are the crazy ones. It is immensely rewarding hearing from our customers that our brand and messaging resonate with them and that they can have a great wedding without taking it all too seriously. I think a good motto is “be scared and do it anyway”. In order for your career – and life – to move forward you should always be a little out of your comfort zone. It is absolutely okay to be intimidated by a big new challenge, but don’t let that intimidation turn into an excuse to stop. Juliet Horton is the founder and CEO of Everly, a Seattle based wedding tech startup. Follow Everly on Instagram. Journal: Start writing down the things that you enjoy doing at your job, the projects you were proud of, and the things that get you excited. Do not feel pressure that you have to do this all in one sitting, things will reveal themselves over time. Talk it out: Speak with trusted friends and colleagues to ask them what they feel are your best qualities and talents. Hearing from someone else usually helps to open us up to the ideas that they might present or reveal. We tend to self edit when we think of things or we are too hard on ourselves. You don’t have to do exactly what they say, but be open to the ideas the present. Reflect: What do YOU think are your best qualities or talents? Everyone else can tell you, but you must answer this one yourself. Really thing about not only your talents, but the things you enjoy doing as well. This may be morbid, but what helped me answer this question was asking, “What do I want people to remember me for when I am gone?” Really made me think of the person I wanted to be remembered as, which allowed me to think of that in context with my career. Once you are able to answer the question, “Where do you want to be this time next year in your career?”—you will then be able to fearlessly build your personal brand. You can sign up for our FREE email course, 3 Days to a Stand Out Personal Brand, right here to get started. Creating a calendar and planning ahead is going to be the key to build your personal brand. I recently gave a workshop at QuickBooks Connect about ‘Nurturing Your Online Brand.’ I talked about the three keys to building your brand, which include; Consistency, Storytelling, and Authenticity. In order to show consistently, you must plan ahead. And trust me, I understand how difficult it can be to plan ahead. I am more of the spontaneous, fly by the seat of my pants type. As I have grown in my career—and married a planner—I have found great joy in organization and planning. It is also crucial for me to plan ahead as I balance my full-time job, building Be Digable, and working with clients. One of the biggest requests I have received from YOU is a content planning calendar. Therefore, I have created a 3-page worksheet that you can print our or save to assist you with your content planning. This can seem very daunting, but it will set the tone and make it much easier for you to plan. Think about the answer to this question, “Where do I want to be this time next year?” It could be in a new job, a higher position within your current field, expanding your network, building partnerships, more speaking opportunities, and more. In the worksheet, identify your top 3 professional goals. Based on those goals, then identify key dates and tent poles in each month—either events that you are going to be participating in or key events within your current or aspirational industry. When you identify these key dates, it is a reminder to be either attending/participating in these events and more importantly engaging in the conversation online. To grow your influence, you must position yourself within the community you are looking to develop your personal brand. Therefore, you must put yourself in the middle of those communities. If there are months that you can’t identify key events, then think of a topic that you can make sure to speak on in that month. Once you have identify the major tent poles throughout the year, it is time to become more detailed within each month. If you are looking to get into fashion or grow within fashion, then you probably identified September and NY Fashion Week as a major tent pole. With the monthly template, break down each week in September based around NY Fashion Week. In Week 1, you are probably going to post about you getting ready for the week—maybe some IG stories of you shopping and choosing outfits. Or maybe you are posting about how busy you are getting your brand/business ready to host an event/attend. Week 2 you are going to post behind the scenes content of you running around, hosting events, meeting with other brands, etc. Week 3 maybe you create a recap post and blog where you give your POV of NY Fashion Week and what it means to you. In Week 4, you can post about how you are taking a few days off. You can use this across industries, if you are in tech, then you are doing to make note of major conferences that your company is hosting or that you will be attending. You see where I am going with this? Ok, now that you have an overview of your year and you broke down content ideas by month, it is now time to create your posting cadence for each week. I encourage you to build out the daily posting calendars at least a week ahead of time. Make sure to include copy and links to assets to make it easy for you to schedule. Give yourself at least a week of ahead of time in case you need to route for approvals or need time to create assets. If you haven’t already, make sure to download the Easy Breezy Planning Calendar to get started planning today! 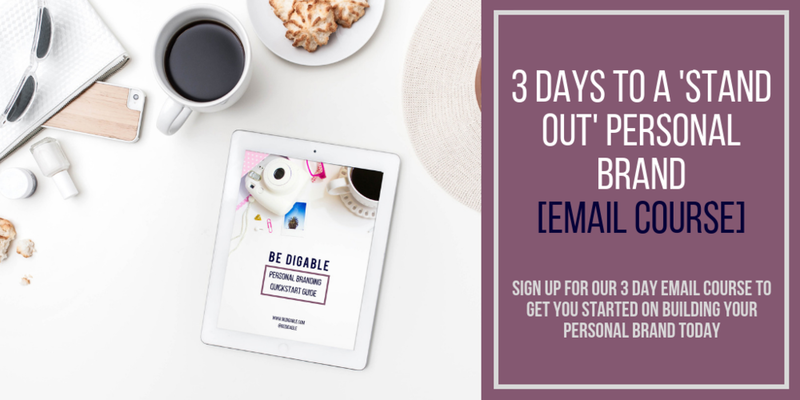 If you haven’t already, join the 3 Days to a Stand Out Personal Brand email course to build the foundation of your personal brand. When I first started to brainstorm ideas of what Be Digable should be, I kept coming back to helping females in business. In my 10 year career in marketing, I have been very fortunate to have worked for very smart and strong female leaders. I know that not every girl is as fortunate as I am to be able to learn from female executives or have models of them to look up to in the C-suite. My experience and drive led me to create Be Digable to help female executives build their personal brands to position themselves as thought leaders. It is important we are seen and heard. In my passionate mission to build Be Digable, I have come across some incredible resources and communities for women in business. One of those communities has been Ellevate Network. Ellevate's mission is to help women advance in the workplace, both for themselves and the greater good. They strive to change the culture of business from the inside out - by investing in women. I was so inspired, and yearning for community, I joined their LA Chapter. I am thrilled to be launching our brand new series, Women Who Lead, with Kristy Wallace, the CEO of Ellevate Network. Women Who Lead aims to highlight female leaders and their unique perspectives on how they got to where they are today. Kristy is responsible for executing Ellevate Network’s mission to close the gender achievement gap in business by providing professional women with a global community to lean on and learn from. Dive into our Q&A below to learn more about Kristy! I've had a number of great bosses. One boss was incredibly creative, the other taught me everything I know about sales, and another was always my biggest advocate in the office. What's important is that every boss was different and had their own unique leadership style. One trait that all of the great bosses shared was a powerful ability to communicate goals, to inspire action, and to acknowledge successes. They also cared a lot about employees and fostering an environment of inclusion and success. Sallie Krawcheck! I've had the great pleasure of working with Sallie for a number of years and I appreciate all that she's done and continues to do to push for gender equality. I'm really inspired by Sylvia Acevedo, currently the CEO of the Girl Scouts of the USA, who has a degree in Systems Engineering and worked at NASA, Dell, and Apple. As a new leader, it can be hard to let go of responsibilities and delegate. But holding on to prior tasks will weigh you down. Trust your team and share responsibilities as a way to help everyone grow in their roles. Another piece of advice is to be very intentional about how you communicate with each team member. Communication is tough. Some people love heated debates while others thrive on positive reinforcement. Taking a few minutes to learn how best to communicate with each team member can lead to stronger alliances and deeper dedication. It is important for me to give everyone in the company a chance to lean, grow, and shine. I don't want a team member to become a manager never having managed anything before. At Ellevate we often have special projects that role into our core business objectives and we offer anyone in the company a chance to be a leader and decision maker on projects, to provide input, and to take ownership. I've learned to trust my gut and to own my vulnerability. As a leader at Ellevate Network, I recognize my vulnerability every day. I don't have to be always perfect or right; in fact, I'm very comfortable admitting that I don't know the answer. There is always space for team members to offer up a different opinion, and we pride ourselves on an open and respectful dialogue around the business challenges that we're collectively working to solve. I think this approach makes me a more successful leader because ideas and innovation come from everyone on our team, which leads to a deeper sense of employee ownership and engagement. I always thrived in leadership positions. From an early age I ran for school president or volunteered to be the leader of a club. Even with my first job i quickly became a manager. Believe in yourself and your abilities, value relationships in the workplace, and always try to learn new things. Your brand is what people say about you when you aren't in the room. Are you creative? Hard working? Trust-worthy? You want to own your own brand and how others talk about your strengths and abilities because these discussions can lead to new opportunities! Leverage your Squad! I have a close group of peers that support me. They help me role play tough conversations, offer advice on business and career decisions and are my biggest cheerleaders! Thanks again to Kristy for taking the time to share her experience and insight! You can learn more about Ellevate here and listen to Kristy on the Ellevate Network podcast here. Time. There is never enough of it. Amiright? When I talk to clients about personal branding, they admit they don’t have the time to keep up with it. However, we should make it a priority because it is important. And if you dedicated ONE hour on a Sunday to plan things out for the week—you would be set! One of my goals is to help clients find time in their week to build their personal brand. I think we all look for ways to make what we do more efficient. I highly recommend Amy Porterfield's Online Marketing Made Easy episode featuring Michael Hyatt where they talk about creating your ideal week to be more productive. I don't know about you, but I love a great organized To Do list. Trello is a great project management organization tool. You can create boards for various topics and create tasks under each with due dates + much more. Instagram is the platform that the majority of us spend the most time on. Later is a GREAT tool and resource for Instagram. You can visually plan and schedule your posts on Later. They also have an informative blog that has amazing tips and news on the latest Instagram features. Do you ever look at someone's cute post and wonder, "How did they create that?" Canva is one of the most incredible creative resources and you can use it for FREE. They have TONS of templates for social media and other visual materials. This is one of the most underutilized features on Instagram. It is a way for you to save and organize Instagram posts you want to remember. I wrote a blog with tips on how to organize your Instagram Collections here. One of the easiest ways to keep up with your personal brand is schedule some of your posts ahead of time. Hootsuite is one of the most well known platforms for social media management. You can create an account for free and take one hour a week to plan out your posts for the next week, two weeks or month. Get these tips and more in our Personal Branding Quickstart Guide! You can download it for FREE right here. Whether you know it or not, you have a personal brand that you are cultivating everyday through your online presence (you will hear me say this alot). I am very passionate about owning your story and utilizing your online presence to share that story. Your story and who you are IS your personal brand. I believe in telling your authentic story; the good and the not so perfect. We are in an age of finely curated feeds reflecting our finely curated lives. However, it is not reality. My goal in assisting with building your personal brand is to identify the key topics and themes in your business and personal life that you enjoy sharing and in which others would benefit from learning. I'm thrilled to share that we will be hosting two FREE Personal Branding Workshops in Los Angeles. This is a workshop on how to tap into the power of your personal brand and leverage it for greater opportunities in your career and/or uncover new opportunities. You will walk away with actionable steps to start becoming more intentional about your personal brand by creating your own personal digital strategy. To get ready for the workshop, download the Personal Social Media Audit Checklist now.